The United States, despite withdrawing from a landmark accord aimed at curbing climate change, is stonewalling vital UN talks in a row over how poorer nations' battle against global warming is funded, sources told AFP Saturday. The issue of how those funds are made available to developing nations has emerged as a key sticking point at the Bangkok conference which has made little headway since it opened on Tuesday. The US, which has abandoned the landmark Paris Accord, has tabled a proposal with support from Japan and Australia that seeks to remove rules on how countries account for their climate action funding, according to multiple sources close to the negotiations. This would mean that developed economies -- responsible for the lion's share of planet-warming-feeding carbon emissions -- could still count commercial loans and pre-existing state funding as part of their finance obligations. Under the Paris deal, richer nations were supposed to help poorer nations deal with the effects of climate change, but there are already deep concerns over a lack of transparency and accountability in the process. In addition, observers in Bangkok told AFP that the US and some other developed economies were refusing point blank to discuss the contentious issue of how rich nations inform other states of their future funding plans. The US position is starkly at odds with that of the developing nations, which insist that transparent and predictable finance is needed to effectively plan investment in new technologies and carbon reduction. Poor countries already coping with floods, heatwaves and superstorms made worse by climate change are expected to bear the brunt of the effects of our heating planet. A senior climate negotiator told AFP that the US delegation in Bangkok was "poisoning" discussions aimed at creating a clear roadmap to implementing what nations agreed in the Paris deal. "The US is no longer playing the game but it's still setting the rules," said the negotiator, who spoke on condition of anonymity. Activists rounded on the US -- which is still committed to the Paris roadmap until 2020 -- accusing Washington of endangering hard-earned gains on a global initiative to stop runaway planet warming. 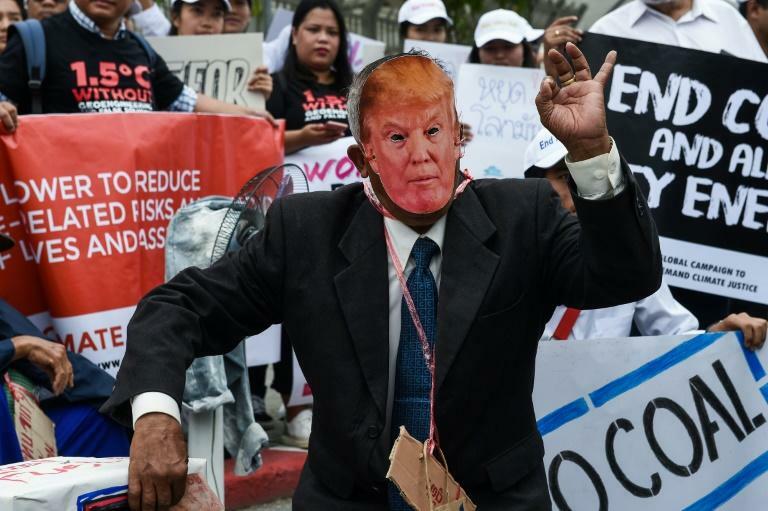 "The role of the US negotiators at the talks is actively hindering progress at this critical stage," Harjeet Singh, the global lead on climate change for pressure group ActionAid, told AFP. He also accused other developed nations negotiating blocs, including the European Union, of "standing on the sidewalk" by failing to stand up for developing countries. The Paris agreement, struck between 190 countries in December 2015, aims to limit global temperature rises to "well below" two degrees Celsius by 2100, shooting for no more than a 1.5C increase if at all possible. Talks in Bangkok aim to narrow down options to present to ministers and heads of state at the COP 24 climate summit in Poland in December.